When Katie Francis of Oklahoma broke a record recently for selling 18,107 boxes of Girl Scout cookies in seven weeks, the world took notice. All eyes were on this ambitious young woman with a creative approach and an impressive work ethic. But what Katie might not be aware of is just how different the cookies she’s selling are from ones she might bake herself. Cookie sales as fundraising for the Girl Scouts of the USA (GSUSA) began in 1922, when the national magazine produced by the group included a cookie recipe for local troops to follow at home. Since then, Girl Scout cookies have evolved from a tradition of home baking to a massive national brand. And rather than developing baking skills, troop member now merely need sales skills to move around two million boxes of a few mass-produced recipes every year. Today, there are two registered bakeries which produce all the Girl Scout cookies in America. Both are owned by larger food conglomerates–Kellogg’s and Weston’s, which is Canada’s largest food processing and distribution company. The cookies vary by recipe and type, but most are made using a long list of industrial ingredients, including some combination of sugar, partially hydrogenated oils, and preservatives, as well as high fructose corn syrup, added whey, added gluten, dextrose, soy lecithen, sodium alginate, etc. And while proceeds made from Girl Scout cookie sales benefit the local troops’ functions (and the scouts, who often receive prizes in exchange for sales), there are many other more direct, cooperative, and healthful ways to support local causes with your sweet tooth. Just head to your local farmers’ market or school bake sale to find any number of homemade, individual cookies baked in small batches with care and creativity. The chorus of Girl Scout cookie critics gets louder every year, but it’s not too late for the Scouts to get on board with today’s food movement. As the organization claims to teach girls how to “bring their own values to the business world,” we thought of a few ways they can reach girls who value real food. 1. GSUSA could organize field trips to the bakeries that produce Girl Scout cookies, including meeting the bakers, packers, shippers, and warehouse staff. (Or, they could go even deeper and include visits to the farms producing the wheat and soybeans that make up much of the cookies’ components.) Might this affect whom the Girl Scouts partner with and how they run their operations? Maybe. Either way, the troops would be better informed about the cookies they’re selling (and eating). 2. GSUSA could introduce healthier, more socially-responsible alternatives to the current cookie line. Omitting partially hydrogenated oils, high fructose corn syrup, and artificial flavors would be a big step. 3. GSUSA could support troops that want to drum up fresh alternatives to cookies. What about partnering with a local orchard or berry farm to sell one-time a box of fruit by pre-order? How about selling other seasonal products like pumpkins, fresh garlands, or tulips? The troops could even organize a field trip to pick the fruit or flowers themselves. These are the kinds of products many girl scouts could sell with pride, because they were directly involved in the production. 4. GSUSA could create programs that teach young girls home cooking skills–and not solely for desserts. There could be regional and/or national recipe competitions and cook-offs where girls are rewarded for their creativity and sophistication in the kitchen. 5. GSUSA could encourage girls to get into the garden. Like the gardens in schools, official troop gardens might introduce new fruits and vegetables, and teach young women valuable lessons in environmental science and teamwork, while providing a reason to exercise. Cookies might be a treat to eat in moderation, but when they represent a national youth development organization, we should expect more than the status quo. It’s time to stop denying that solid cooking and agricultural knowledge are empowering for young women, not a thing of the past. Do we really want more junior door-to-door salespeople who see food as a numbers game? Or can we find a way to build a generation who truly understand that everything they eat is a valuable product of a complex world? GSUSA: I dare you to try the latter. Hi Cathy: You make some really great points here. Remember the audience you need to speak to are predominately suburban parents (MOMs) who VOLUNTARILY lead the local troops. As a Dad of two girl scouts, I know the many hours first hand that it takes to keep the troops learning and moving. I agree, as a food industry professional that much more could be done to "uplevel" the mass produced cookies. Remember this is a fundraiser, so cheap product is the rule. I personally prefer to write a check to my local troop, that way 100% of my money goes to work vs. the pennies on the dollar per box of cookies sold. Begging for money (direct donations) would be a better model than selling stale cookies with a chemisty set of ingredients. Girl Scout cookies should be made by the Girl Scouts themselves from scratch using only the finest organic ingredients. Gluten free, too. 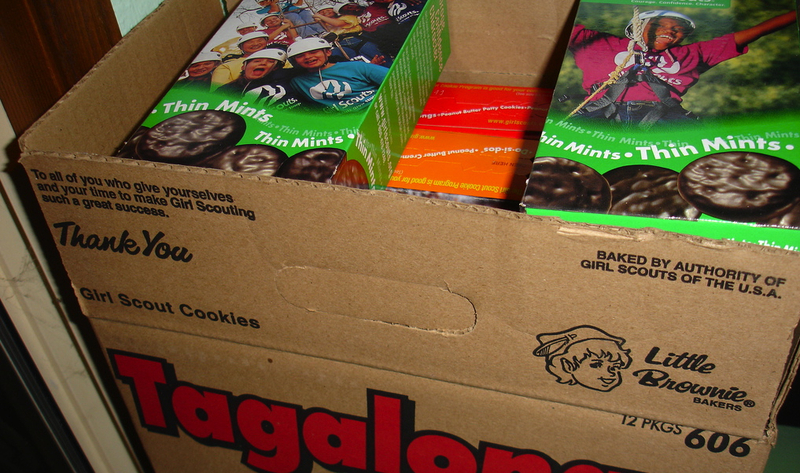 It is just lazy to let Girl Scouts buy crappy industrial biscuits for resale. That only teaches them to be sleazy salesmen. We need to be teaching them how to cook. And then they should be giving away most of the cookies. Why is profit the be all end all of everything? What sort of community service is it to foist highly sweetened industrial garbage on people? I am so offended by how these wonderful girls are used and corrupted by GSA. I stopped buying GS cookies a couple of years ago when I realized they were using palm oil and destroying the orangutan habitat in Indonesia and Malaysia. They bought a seal saying their oil is sustainable but they are still using it, and will until their bakers can find an alternative--supposedly by 2015. I doubt they are trying very hard. As a GS, I was taught to leave a place better than I found it. This is completely opposite of that rule. Not to mention that the other ingredients are artificial, and unhealthy. They need to clean up their image. I also make donations to my local troop in lieu of purchasing. None of my money goes to the national administration. The fact the the Actual troop only makes 80 cents a box on such a GARBAGE product infuriates me. I will never buy these overly processed and cheaply made "cookies" for my family. I will give the troop money directly. Very sad this "non-profit" exploits these well meaning families. While you make some interesting and valid points here, Ms. Erway, I'd urge you to take a look at the Girl Scout badge books -- the basis of the Girl Scout program -- before critiquing the entire program based on the cookie sale alone. Cookies do not represent our organization -- our Girl Scout Law does. Your point No. 4 is addressed through The Simple Meals badge in the Junior book, which teaches girls how to cook healthy, balanced meals for breakfast, lunch and dinner. And point No. 5 is addressed by individual troops across the country that work on the Gardening badge. In my troop, that involves annually planting a vegetable garden and donating the produce to our local food bank. Our cookie sale proceeds pay for the seeds and supplies. 1. The tone in which the article is written. 2. The lack of research/true knowledge of Girl Scouts. It is glaringly obvious that the author has not fully researched what Girl Scouts do nor the opportunities available to girls individually and as a troop. Because if she did, then she would know a lot of what she's suggesting ALREADY EXISTS in Girl Scouts. You make some really interesting points, and I agree with several of them. If any organization should set a good example, it should be the Girl Scouts. The comments are a little harsh on the Girl Scouts & the blogger could have done her homework better. You can find all of the different badges here http://forgirls.girlscouts.org/home/badgeexplorer/ with just a simple google search - including badges for gardening & simple meals. Forcing girls to make and sell cookies doesn't sound like a particularly progressive solution either. Back into the kitchen, girls! @Jenn: Thank you for mentioning the cooking and gardening badges. The ideas in the piece were meant as suggestions for broader, institutional changes and alternatives to the cookie program, which receives high participation nationwide (and, given the piece's lede, attention). @Christy: I hope that addresses your concerns and appreciate once again bringing up the multitude of badges that have been established by GSUSA. @Caylor: Actually, hands-on skills in both making and selling product is progressive as well as responsible; and encouraging of a more socially responsible economy. And dare I say, fun? I totally agree. When I became aware how little the girls get (a measly 20%) and on top of that are not allowed to have any other fundraising events aside from GSUSA I immediately stopped selling and buying the cookies and we are no longer members. It doesn't teach values to the kids when they sell a box of cookies for $4 and have to pay $3.20 for it when u can buy a better quality product for $2 at t market all day long. That is exploitation! The Girl Scouts could do a lot better than cookies.